My third stadium of 2012 was on Tuesday 17th January 2012 at The New Den in Bermondsey, London. The match was Millwall vs. Dagenham & Redbridge in an F.A. Cup 3rd Round Replay. The New Den is located next to a railway line in south-east London. South Bermondsey is the nearest railway station with it situated around a third of a mile from the ground. The nearest tube station is Bermondsey station on the Jubilee Line which is just over a mile away. 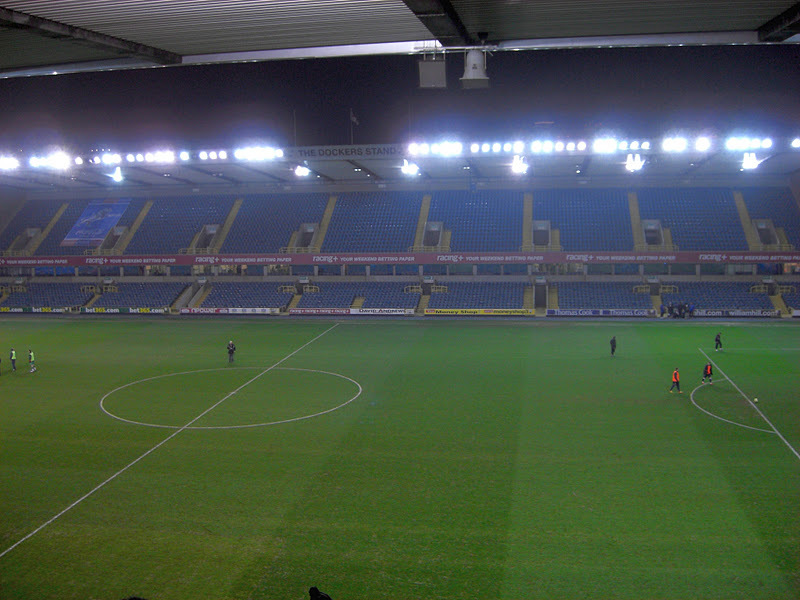 The venue has been home to Millwall since 1993 when they moved just a few hundred yards down the road from their previous stadium, The Den, which the club had played at since 1910. The New Den has four two-tiered stands giving the venue a total capacity of 20,146. The four stands are isolated from each other and rather similar in nature. The West Stand runs the length of the pitch and is where I watched the match from. This stand also houses the family enclosure and press box. Opposite this on the east side of the venue is the Dockers Stand which contains executive boxes in between the two tiers of the structure. Behind the goal at the southern end of the ground is the Cold Blow Lane Stand which consists of unreserved seating for the home fans. Behind the opposite goal is the North Stand which houses away supporters. The North Stand is blocked off from the rest of the stadium and even has a special walkway leading it to and from South Bermondsey railway station to avoid rival fans coming into contact. The game was an F.A. Cup 3rd Round Replay between Championship side Millwall and League Two side Dagenham & Redbridge. It did not take long for the scoring to be opened as Darius Henderson shot into the bottom corner of the net in the 7th minute after Harry Kane's shot was blocked. 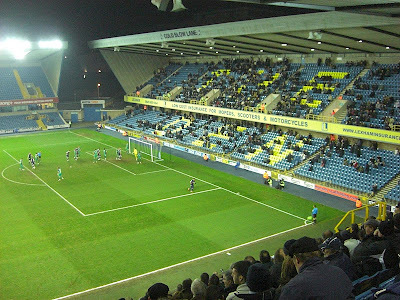 Millwall continued to press the visitors for most of the first period and just before the break added a second when Harry Kane advanced forward and produced a low shot into the goal from the edge of the box. Dagenham started brightly in the second half but found themselves 3-0 down in the 59th minute after an excellent team move by the hosts culminated with Darius Henderson tucking the ball in from close range. Just four miinutes later Henderson was presented with a chance to complete his hatrick from the penalty spot after a trip in the box. He duly did so to put Millwall four goals in front, and within two minutes the hosts notched up their fifth when Harry Kane steered home from close range. After this Millwall took their foot off the gas as Dagenham enjoyed a decent spell, generating a few opportunities. 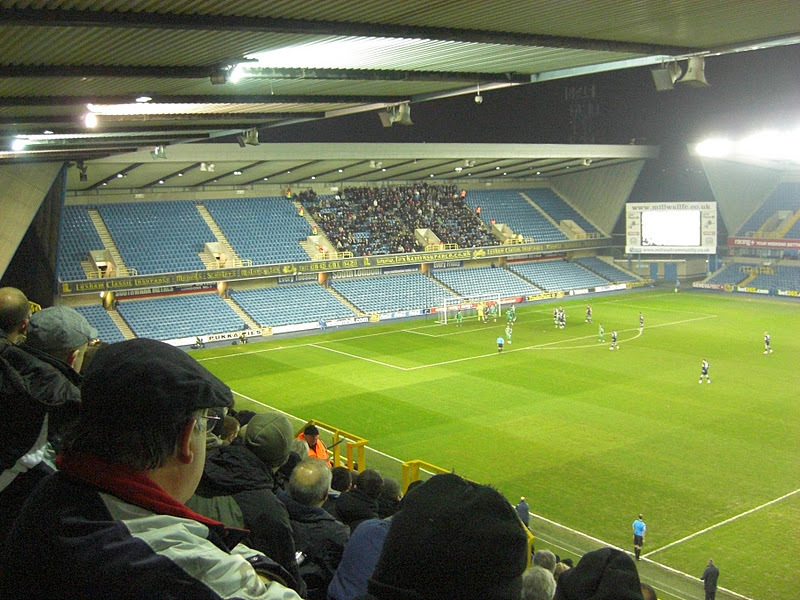 However, no more goals were scored and Millwall advanced to the 4th round of the F.A. Cup as 5-0 winners.